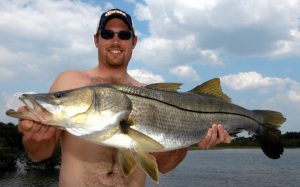 Snook fishing in Tampa/St. Petersburg with Captain Wade Osborne is a drag screaming experience. People travel from all over the world to tangle with this highly acrobatic and most prized Florida species. 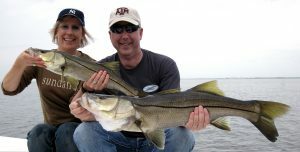 Methods for catching snook include spin casting with live-bait, plug or jig fishing and fly fishing. 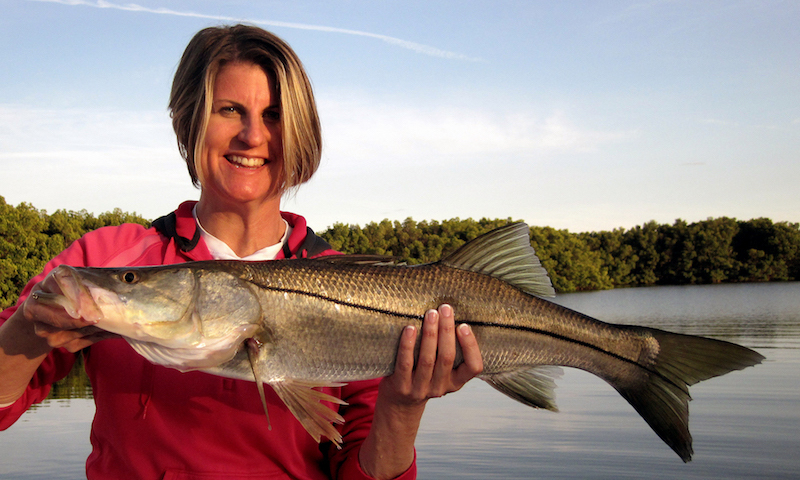 Snook can be pursued year-round with most fish weighing between 3 to 14 pounds. However, the fishing is exceptional from March through November when the fish are most active. 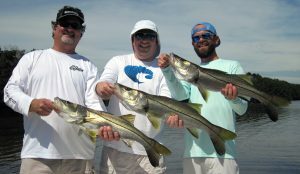 During May, June, July and August when the largest of the “linesiders” are spawning, catching 30 plus snook during one outing is commonplace with some fish weighing possibly 15 to 25 pounds. 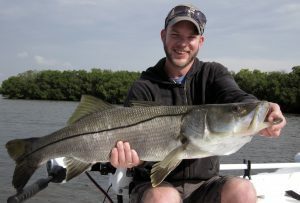 Nothing is more exciting than watching a snook inhale a fly, plug or live-bait. 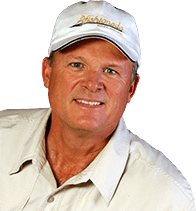 Osborne targets mangrove shorelines, grass flats with sandy potholes and oyster beds when plug, jig or fly fishing for snook for a perfect shot at an unsuspecting fish that is lying, in wait to ambush bait. When using live scaled sardines, Osborne fishes some of the same areas, but he anchors the boat and employs a live-bait chumming technique. Baits are squeezed by hand and broadcast in an area with fish to trigger them to feed. Then hooked baits are presented in the same spots for a solid hook-up. Landing a snook is often a battle of wits. You have to take into account you’re fighting a fish in its own home territory. They know where every oyster and mangrove root is located and will use it to their advantage to cut themselves free. The initial run is often the deciding factor in landing a snook, but once free of all the hidden obstacles the leader could still be severed by the snook’s razor sharp gill plates. Year-Round. Closed to harvest May through August and December through February on the west coast of Florida. One fish per person, per day on Florida’s gulf coast. ©2019 Afishionado® Guide Services Inc. Afishionado® is a Registered Trademark; All Rights Reserved.